I had the good fortune of being taught a lot of life lessons by an old cowboy named Dusty Rhodes. Yes, his name really was Dusty Rhodes and he really was a cowboy. I was a young girl who loved horses and he was an aging man who had horses and lots of patience. He saw in me something more than the casual horse lover. He saw a passion for all things horse and he cultivated that passion because he could relate. Most of what I know about working with people, I owe to Dusty. The same principles he used with horses work with people. I may expound on more of them in another post. For now I want to focus on what he taught me when we first got started. Dusty taught me that a horse was never going to think or act like anything other than what it was; a horse. If I was going to be any type of cowgirl, I had to get ready to be one [a cowgirl]. I had to be the one to learn to think a new way. I had to think like a horse. Training me to have horse sense started with basics for my safety. I remember one time he was teaching me the safest place to be and how to avoid being kicked. Somewhat horrified by the prospect of pain and looking for some reassurance I asked, "But Apache has been trained and has good manners, he won't kick me, right?" What I expected to hear was "No, he would never kick you." Instead Dusty told me the truth. "Apache ain't never offered to kick anyone that I know of, but he is a horse and he will kick if he's given the right reasons to." He went on to give me another pearl of cowboy wisdom. "Before a horse kicks or bucks or bites, he gets ready to. If you can learn when he's fixin' to do it, you can generally change his mind before he does." 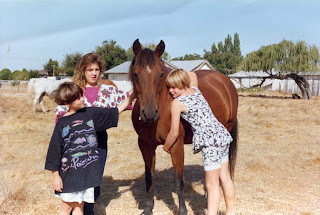 Dusty did much more than cultivate my love of horses. He made me work for the privilege of riding by showing my willingness to care for his animals responsibly and to think of their welfare first. I enjoyed brushing them, feeding them, cleaning their feet and learning from him how to think about things from a horse's perspective. Before he let me be a rider he made certain I was ready to ride. He didn't turn me loose at the rodeo grounds, which is what I really wanted more than life itself. First he made certain I knew how to fall off and get back on. I had to prove I could do that from a walk and a trot before I was ever allowed to ride at a gallop. What's more I had to do it both with and without a saddle. He didn't keep me from being bumped and bruised, but he did give me the tools I needed and when I was ready he let me ride. The correlations here may be obvious, but they are important enough to state very clearly. Before you can be a Titus 2 woman, you have to get ready to be one. You cannot teach someone what is good before you can identify what is good for yourself. It doesn't matter in the slightest what you think good is. What matters is what does God think is good? That's what you have to be able to teach. If you do not understand your own salvation and your own sanctification process you will be ineffective when trying to help others. In order be a Titus 2 woman you have to start thinking like a Titus 2 woman (Romans 12:2). Transformation takes time, it takes work and it takes being lost in a passion and purpose that is greater than you. It is not for your good that you prepare to be a Titus 2 woman, though it is beneficial to you. We don't seek holiness for our good even though it is good for us. We seek holiness because we are directed to by Almighty God (1Pet 1:16). In the same way, we get ready to used as Titus 2 women because we are directed to. It is not an option, it is a directive. The only way to get ready is to be immersed in the Word of God. You must know it, you must believe it, you must bend your will to it. The Word of God in the woman of God will make you ready. Do you know the value of God's Word? Are you willing to be used as God directs? Are you willing to be willing? Here are some Scriptures to begin meditating on. 5 Thy testimonies are fully confirmed; Holiness befits Thy house, O LORD, forevermore. 4 For whatever was written in earlier times was written for our instruction, that through perseverance and the encouragement of the Scriptures we might have hope. I can't tell you how much of a blessing your words are to me right now.